As fuel cell technology gains ground, carmakers will find new ways to incorporate it into vehicles beyond mere motive power. In a noteworthy development for social sippers everywhere, Volvo has used it to create a gadget called the Alcoguard, which is a fuel cell breathalyzer. The use of fuel cells is occasioned by their accuracy. Apparently, European police already use fuel cell breathalyzers, which render more accurate readings because the membranes react only to ethanol and nothing else. The more molecules of ethanol in a potential driver's breath, the higher the electrical current created when they pass through the membrane. In Sweden, the unit is tuned to let the car start at readings of less than 0.2 g/l. 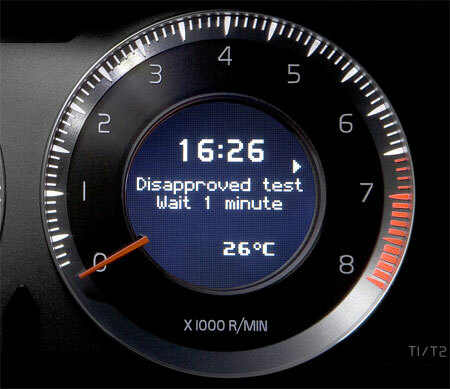 Above 0.1 g/l, the car will start, but it lets the driver know that he shouldn't drive. The Alcoguard can, of course, be calibrated to each country's particular limits. It will be available on the S80, V70, and XC70 models from next year, and will cost 900 euros.